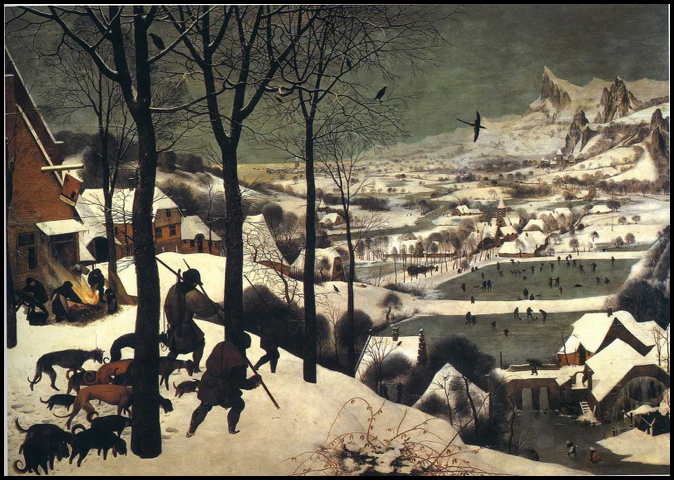 A tale of time-travel and the power of art: Two quarreling sisters, Bea and Abby, vacation together in hopes of getting closer, when one of them vanishes through a portal into Bruegel's painting "Hunters in the Snow" in the Vienna art museum. Bea loves this world where mysteriously all her pain and ailments evaporate. With help from kindly Jack of the American Embassy, Abby searches for her sister. Returning to the museum with Jack, Abby disappears into the painting too, going after Bea with a vengeance. As the sisters face off in the freezing climate, people in the painting touch their lives: Smart-mouthed detective Elsa, an art history major, going in and out of the painting at will, handsome hunter Hans falling for Bea, his friend Fritz, and Bruegel, fiery and philosophical, who doesn't approve of modern people in his world. Bea likes Hans, and loves being in the painting. Look closely. She's there on the ice. Skating.